Bucks are meaningless when it comes to Burch. 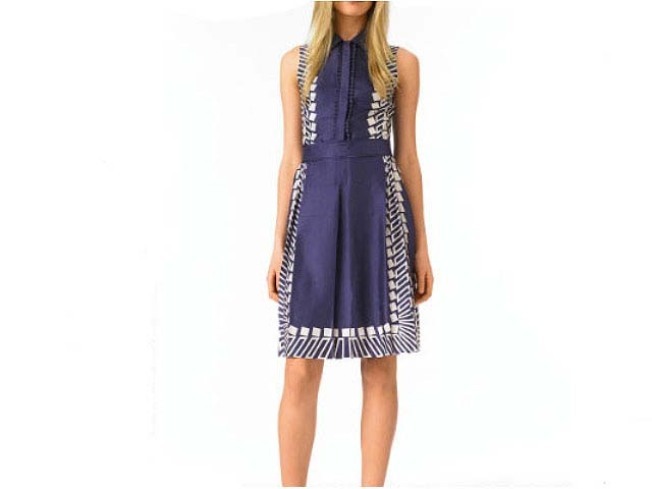 Tory Burch clothing on sale is generally still more expensive than non-Tory Burchnot on sale. (Sorry, did that even make sense?) Nonetheless, we must inform you that Tory's pre-fall line is now 40 percent off and summer is 60 percent off if you order directly from the Web site. Plus, you'll score free shipping on orders of $150 or more (which is probably, like, one shoe). Our current desire: The Patricia dress (was $475, now $285). We love the whole faux apron thing going on -- seriously, when has that look ever been so glam? Pair it with simplified gladiators now or open-toed booties going into fall. We've all been there, feverishly filling in the last few holes in the plaster -- with toothpaste -- while your double-parked U-Haul idles at the curb. Nope, apartment-dwellers have never had it easy, but Outblush has tipped us all to the latest in the vinyl wall decals craze, these "infinitely re-positionable" photo frames from Photojojo.com ($20 each; two for $36). You won't have to hammer any more pics into the wall, and these adhesive frames won't damage the paint. You can also swap images whenever you'd like since the stickers are completely reusable. Piperlime -- and it seems like pretty much every other footwear retailer -- is pushing peeptoe booties, hard, and we have to admit all this advertising is starting to wear down our hard outer shell of "but peeptoe booties just don't make sense!" Plus, if you're making your very first purchase from Piperlime before the end of of the day Friday, save 20 percent with code BZJ9HZH941FT. Our top picks: Marc by Marc Jacobs blue suede booties ($465) with a grosgrain ribbon wrapped around the ankle, or -- for the slightly more budget-minded, a Charles by Charles David Fluster ruched pair ($125) available in plum or black. If you've just gotta try on your booties in person, we suggest Shoe Hive (115 S. Royal St., Alexandria), SimplySoles (1435 Park Road N.W.) or ShoeFly (2727 Wilson Blvd., Arlington; 1520 U St. N.W. ; 4731 Elm St., Bethesda).